Employing our TMI series rotary axes with torque-motor offers you new manufacturing possibilities, due to the high speed and dynamic movement. The power transmission with this technology is free of wear and gives you constant quality of your produced parts for several years. 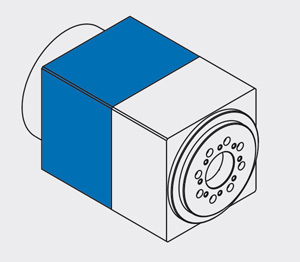 Arranged around the spindle, the torque-motor (sleeve-shaft motor) is designed for the highest possible torque. Optionally these motors can be water-cooled for maximum performance. As this system works without any gear drive, expensive transmission repairs after a collision are now a thing of the past. A superior performance in rotation speed and dynamics, compared to the gear-driven dividing heads, offers a much bigger scale of manufacturing possibilities e.g. turning processes or circular grinding. The measuring system is linked directly with the spindle of the rotary axis and gives the highest positioning accuracy. Furthermore, there is now NO backlash! The main bearing is a very rigid, compact and high-precision design. 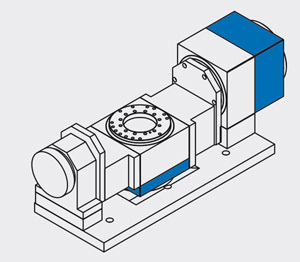 All units have an integrated spindle clamping system, which enables the unit to take very high manufacturing forces. The sophisticated overall design gives the units a very compact dimension. A wide range of additional equipment offers you a modern and integrated concept. Individual solutions for specific requirements are always possible and realisable. The rotary axes of the TMI series can be used with almost all modern CNC controls. The rotary axis-flange-integral modules type TMI-FL have been designed to easily fit a dividing head into a machine system. 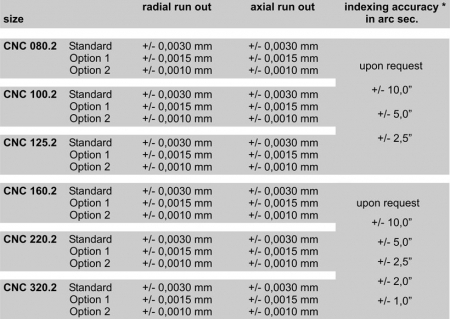 Compared to the standard TMI axes, the only difference is the flange-type, round housing. All internal parts and therefore also all technical details are completely identical with the standard TMI series. The housings of the units are made of high grade case-hardened steel or high-tensile aluminium and offer maximum stability with a very compact design. The housing is precision ground and completely sealed against coolant and chips. 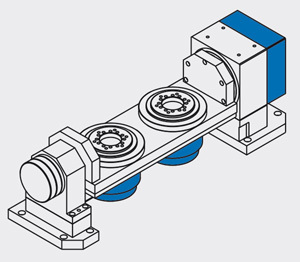 Due to a centring ring and counter bores attached to the housing, the unit can easily be integrated and mounted into a machine system. The cable outlets and various other connections for example, the coolant supply are arranged in a way that there will be no interference to the circumference of the unit. This gives you the possibility to mount the units vertically or axially into the machine system. 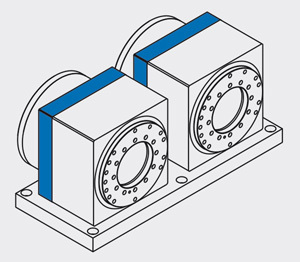 Multiple units can also be placed next to each other for multi-spindle machining. The universal use together with the compact design, the defined interface for the connections in the machine as well as the exchangeability of the units for service or repair, guarantees the maximum production benefits from these axes. TMI Torque-series: speed, clamping force …..
Technical details are valid for TMI built-up and built-in versions (flange version)! * the given accuracies are only valid with the respective measuring device (encoder)!